Down To Earth™ Alfalfa Meal 2.5-0.5-2.5 is an exceptional source of plant-derived nutrients. It is highly recommended for roses as well as all other vegetables, herbs, flowers and shrubs. DTE™ Alfalfa Meal 2.5-0.5-2.5 is derived from sun-cured, non-genetically modified alfalfa that is freshly milled to preserve the highest plant nutrient value. An excellent soil conditioner, Alfalfa Meal is a rich source of trace elements and natural growth stimulants. 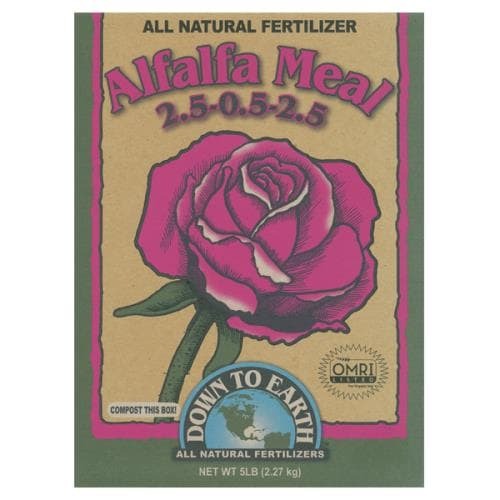 Recommended for all flowering shrubs and especially roses, Alfalfa Meal accelerates growth and promotes larger, more plentiful blooms. It is also useful as a compost bio-activator due to its high organic matter content and ideal Carbon-to-Nitrogen ratio. To prepare smaller gardens, apply 2-4 tbsp. per square foot and thoroughly mix into the top 3″ of soil. To prepare larger gardens, apply 5-10 lbs. per 100 square feet and thoroughly mix into the top 3″ of soil. For new transplants, add 1-2 tbsp. per hole, mix into soil and water in well. To feed established plants, side dress ½ cup once each month during the growing season to promote plant growth. For new plantings, add 2-4 tbsp. per gallon of soil and mix thoroughly or add 5 lbs. per cubic yard. For established plants, lightly mix 1-2 tbsp. per gallon into the soil surface once each month during the growing season.